ANCIENT ALIENS SEASON SIX VOL. 1 digs deeper into what role aliens may have played in shaping our world. Explore whether lost islands and mysterious, Eden-like paradises were actually earthly homes for aliens, and find out why the Greeks, Macedonians, and other ancients believed the world's mountains to be sacred homes to all-powerful gods. Experience American history via rock carvings from an 8,000 BC man-made cave filled with ancient objects and mummies. Is there a link between this cave and the Native American legend of the "star beings"? From the "treasures of the gods" that may have been purposely hidden and protected by an extraterrestrial source, evidence of the famed "Ark of the Covenant," and even ancient celestial travel through "stargates" to tales of ancient life on Mars, there are worlds to explore in this special compilation. Includes interviews with David Hatcher Childress, Giorgio Tsoukalos, Erich von Daniken, Mike Bara, William Henry, Robert Clotworthy and many others. Includes: Aliens and Forbidden Islands; Aliens and the Lost Ark; Aliens and Mysterious Mountains; Aliens and Stargates; Aliens in America; The Star Children; Treasures of the Gods; Aliens and Red Planet; more. 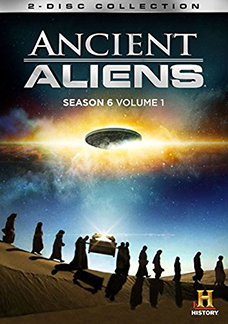 ANCIENT ALIENS SEASON SIX VOL. 1. 2-DVD Set. 352 Minutes. 2 DVDs in Box.